Many a well-fed friend has cautioned me not to go to Antonio’s Grill. Their arguments were never about service or the quality of food but always about the cost of such a common culinary endeavor. In other words, why exactly would you spend such an exorbitant amount of cash on a meal that you can get for a song at any street-side, turo turo carinderia? The answer is simple. It’s Antonio’s. I have never hidden the fact that I am an unabashed Antonio’s fan. As any food lover who has dined at an Antonio’s establishment will attest, Chef Tonyboy Escalante and his staff have raised the bar in defining what dining out should be—a bit of gastronomical theater that not only feeds the stomach but also the soul. Enough of waxing poetic. 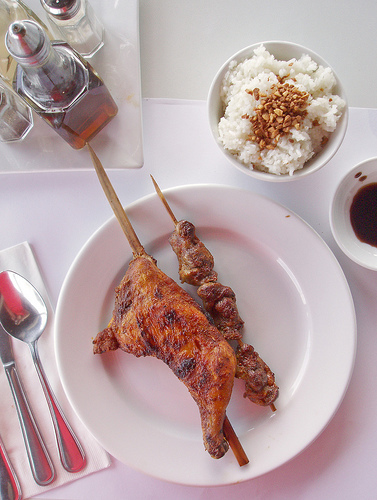 I have a very specific reason for going to Antonio’s Grill—to try their much-discussed Chicken Inasal. Closely associated with Western and Southern Visayas, Chicken Inasal is dish of marinated chicken, grilled over an open charcoal flame and served with steaming hot garlic rice. Beyond the unusual orange tinge (courtesy of a basting oil of annatto seeds), what makes this dish unique is the deep smoky, salty-sour flavor that make those who have savored this dish keep coming back for more. Being a son of Negros, Chef Escalante has great reverence for this famous regional delicacy and it shows. Keeping to the traditions of a dish born in little Bacolod grill shops, Antonio’s Chicken Inasal (a leg quarter for P110) has a perfect smoke flavor—deep and earthy. Cutting into its flesh, you can almost hear the crunch of the skin. Once you slice into the meat, it weeps tears of orange oils. To call this piece of grilled flesh moist is an understatement. Is it expensive? Yes. But short of finding my way to Bacolod, their Chicken Inasal is the best I have ever had. And besides, it’s still cheaper than a plane ticket. Hi Anon. I'm not sure about the best. Like Hainanese Chicken Rice in Singapore or Pho in Vietnam or Pizza in New York, everyone has an opinion on who serves the best. 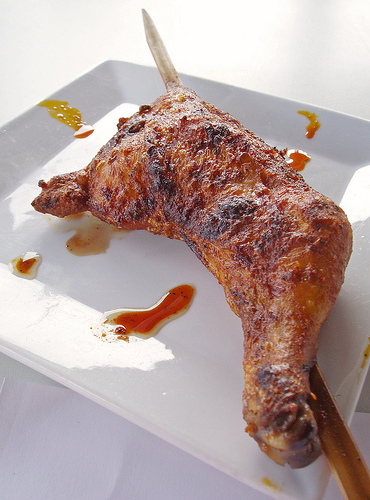 I love chicken inasal and would go for streetside versions or lofty ones like this anytime! Beautiful pic of that leg by the way. it really looks good but the truth is "it's not!!! imagine youre eating "Pangat'(pangatlong -init) like- calderetang lasang karton,sisig na pusit na puro mayonnaise at fried chicken na daing(too salty chicken)- it doesn't satisfy you paying for a pricy food and to tell you "its not worth it"besides having a small rest room for a big restaurant "ITS A REALL RIP-OFF" thats what "antonios grill is all about! Regarding about your comment about Chef Tony Boy "doesnt even cook the food.." its not true. I'm from Bacolod and I know the Escalante family. I can attest that Chef Tony Boy is a great cook. (Why people call him a chef if you think he doesn't cook?) Even before he was young, he has a passion for cooking. I have tasted a lot of his dishes..and it is heaven.. and fyi, if u want to try the original inasal go to BACOLOD and btw, Negrenses knows how to cook the real inasal, the way they should be.